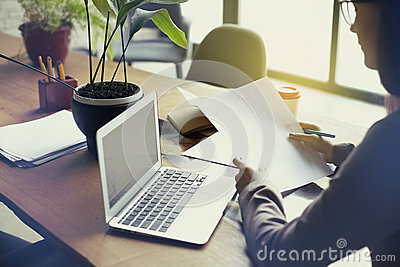 Stock image of businesswoman with documents paper sheet in loft modern office, working on laptop computer. team working, business people. stock image of Documents can not wait. stock image of Businesswoman looking through a magnifying glass to documents note in the office. stock image of Female boss at an online conference meeting. stock image of Businesswoman using tablet computer and calculator for calculating financial documents. Accounting,Finances and economy concept.